You’ll have to forgive me for still being on my manga research kick. It’s just such a novelty, y’know? I don’t know about the rest of the world, but I felt so starved for video game ephemera as a youngster it was a blessing to see any video game franchise as merchandise, as a comic, whatever. I’m not sure if we even had Nintendo comics published in the UK, Nintendo Power and Valiant being such American staples; the closest we got were the two Sonic the Hedgehog comics and the occasional surprise in other magazines such as Max Overload, but it was slim pickings. And then you turn to Japan and it seemed like it was coming down in video game media – more than I can count in the ’80s alone! Whether or not they were good is a whole other matter, but seeing obtuse one-and-done games like Star Force or Pirate Ship Higemaru getting a manga treatment just seems wild… and they’re darn near undocumented online. I could argue they’re interesting little nuggets of history, but I think that’s just me trying to sugar-coat my big dumb obsessions. Just on a lark, I figured I’d make a somewhat chronological list of serialised Mario manga from 1985 to the mid-2000; I’d already been keeping tabs on these in my notes for Scans & Bits, but there was no point making proper sections for them until I had actual material of my own to share. It wouldn’t surprise me if there’s more out there; if working on the Bomberman media section has taught me anything, the moment you think you’re 100% comprehensive, three more obscure manga appear out of the woodwork! 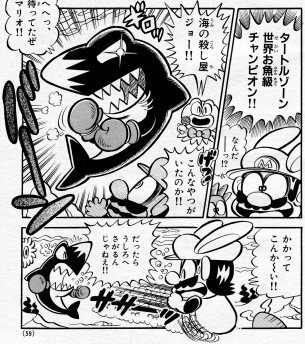 Wanpaku Comic was a magazine similar to CoroCoro Comic that featured video game manga, including a variety of Mario and Mario-adjacent games like Wrecking Crew. Not a Mario series so much as walkthrough-esque one-offs from a variety of artists, but it’s a nifty look at lovingly illustrated versions of the wonky early-days character designs. 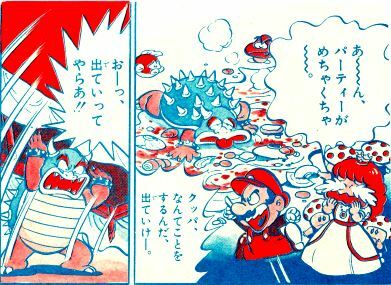 Is this the earliest dedicated Mario manga?? I can’t speak for the earliest stories since I don’t think they’ve ever been rereleased (and any issue of the Shogakukan learning magazines from 1985 to 1999 tends to sell for funny money), but what I’ve seen looks like extremely simple stories for little kids with the occasional puzzle thrown into the mix. No relation! The childish “-kun” suffix is just an easy go-to title, it seems. Short and kid-friendly capers between Mario, Peach and Bowser, who all act like petty dopes. Of the stories I’ve seen, those three are the only defined characters, with Toads and other baddies serving just as page filler – Luigi doesn’t even get a look in! A light-hearted comedy adventure series, looking almost like a prototype Super Mario-kun – the CoroCoro Comic one! As far as I can tell the serialised stories appear to be straightforward adventures sometimes recapping the games (including Super Mario Bros. 3), while what I’ve seen of the books from Super Mario World onward look to have the occasional puzzle page chucked in for spice. An especially irreverent take on Mario starting from Super Mario Bros. 3, with new takes on existing characters, oodles of bizarre pop culture references, and even allusions to western Mario media. It’s somewhat well-known if just because almost every volume is on Imgur. I have to commend it for daring to have a story arc about Wario’s Woods, of all games! It’s about the NES version, sadly, so no manga appearance for my boy Lizardon. Yukio Sawada (沢田ユキオ), CoroCoro Comic (コロコロコミック), 1990 ~ still ongoing! 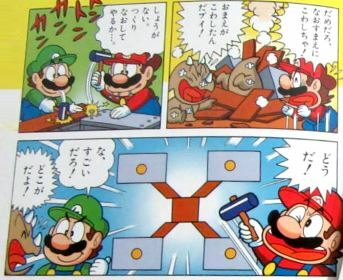 The one everyone thinks of when they hear about Mario manga. To be fair, it has been running non-stop since 1990, sprouted a bunch of spin-offs and even got immortalised as a costume in Super Mario Maker, so it’s nothing if not prolific. It’s full of craziness and juvenile humour, particularly gags about bums and willies, which companies and shareholders in Japan seem a lot more okay with than over here. For a series that ran for 15 years, there’s shockingly little imagery of it online! It’s likely yet another comedy adventure series for tykes, one with a particularly loose art style that definitely covered Super Mario 64 and Yoshi’s Story during its run. Mario’s new pal Yoshi gets his own starring series! 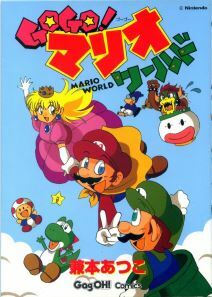 Initially a Super Mario World tie-in until 1994, then reformatted to shill Yoshi’s Island in 1995 with Baby Mario along for the ride. What little I’ve seen appears to be another puzzle page comic for tiny little readers. 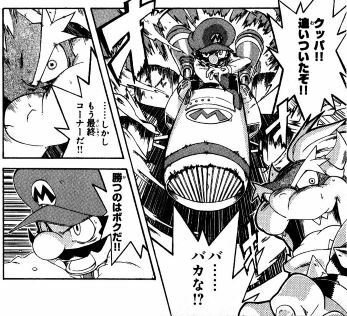 The same author also did a short-lived Mario spin-off “Totsugeki! Super Mario-kun” in 1994, and two episodes of “Super Donkey Kong-kun” in 1995, likely in much the same style. 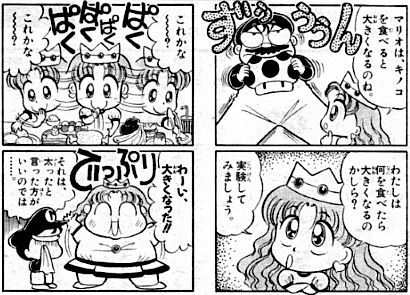 4-koma starring a squat tomboy Princess Peach who’s either playing pranks on her pals or succumbing to some comic pratfall. Apparently more than one of the comics has her dousing her friends in animal piss. That’s charming, that is. 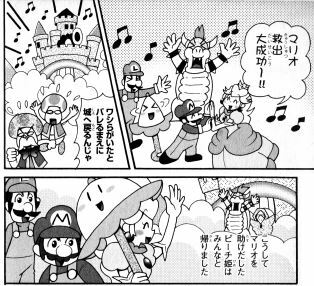 A one-off manga published in an extremely rare 1993 Spring special of CoroCoro Comic, apparently based on Super Mario Bros.: The Movie, or “Goddess of the Demon World Empire” as it’s subtitled over there. The only proof I’ve got of its existence is a record on a CoroCoro manga index (under “９３年夏休み増刊”) I sincerely doubt it’ll live up to expectations, but my life force has drained every day ever since I learnt of it and no one’s shared it. 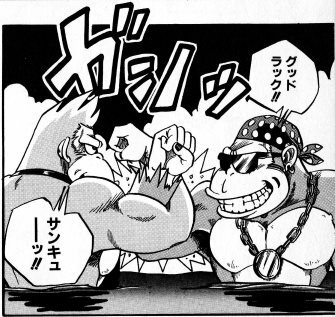 This focuses on Mario and Donkey Kong partnering up to save the day, until Mario went solo after its change of format in 1998 to “Mario no Bouken Land“. 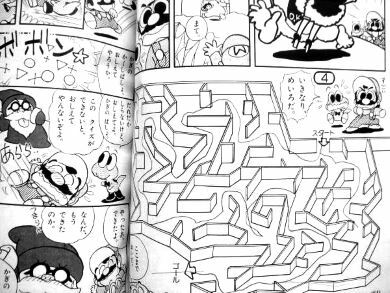 It’s yet another puzzle page comic, wrapping tiny nuggets of story around two-page spreads of maze games, spot the differences and other activities. It’s notable for exploring the whole gamut of Mario canon, including jaunts into Wario Land 2 and even Diddy Kong Racing, and featuring incredibly adorable art by the creator of Hamtaro. A five-episode adventure based on Donkey Kong Country, from DK’s first meeting with little pal Diddy to the whole Kong clan clobbering K.Rool’s crew. Its collected edition proposes “to be continued?” on its back cover with an image of Dixie Kong, who otherwise never appears in the series – as far as I know the author never did get to follow up on the Kongs. A pity, since it’s wonderfully illustrated. A particularly offbeat take on Mario where everyone is drawn as the closest thing to stick figures. 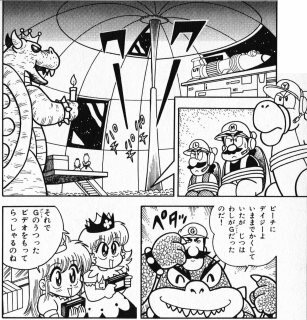 Features some bizarre mundane humour (seemingly in the vein of the author’s 4-koma work) and a penchant for unexpected appearances, like Peach dressing up as Samus Aran and Kirby using Koopa’s bath. Only ran for two episodes as far as I know, but later collected in a Yoshi’s Island anthology. 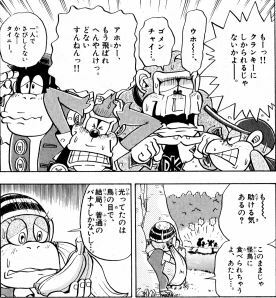 A Donkey Kong manga spanning the three Donkey Kong Country games. Your typical light-hearted adventure japes starring chimps that look nothing like chimps. 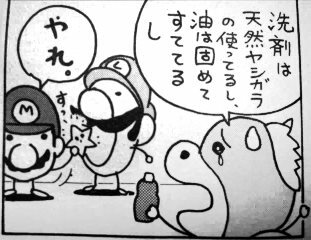 A 4-koma series with a strange twist on the formula, depicting Mario as a violent and oppressive figure who bullies his friends and foes alike, even spraying Luigi and Yoshi with sulphuric acid according to a Japanese review! 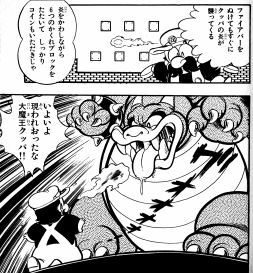 Bowser, meanwhile, is a comparatively warm-hearted sort who has feelings for Peach. You’d hardly believe it based on the cutesy book covers. The series seems pretty rare and I can’t find any images of the manga itself, so I’ve just got to take this fellow’s word for it. 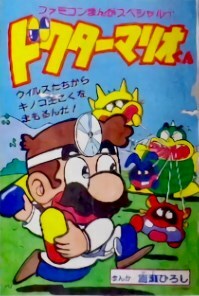 Dr. Mario and Nurse Peach use super-powered pharmaceuticals to resolve crises in the Mushroom Kingdom, usually villainous schemes from Bowser or Wario, or sometimes bizarre transformative influenzas courtesy of the Viruses. No, really, it’s mad about transforming people – turning people into bugs, turning people into inanimate objects, making people buff, making people fat… it’s too cheap a gag to say “someone’s got a fetish for this,” but you could argue the Mario series is all about transforming, innit? The Super Mushrooms, the costume-changing power-ups, the entirety of Wario Land 2 and Yoshi’s Island…! The authors later found success with a long-running Kirby manga in Dengeki Nintendo DS, so the transformative stuff probably found a home in a series where the hero eats people to get new threads. I’m currently on a foolish endeavour to try and collect the series in full, and I’m a little over halfway there. I’ll keep you posted! Not a Mario series, but a comic strip about author stand-in Himemaru recapping her experiences while playing the latest games. Apparently two Mario Tennis and two Mario Party games were covered as part of the series. It’s probably the most on-model the characters have ever looked in manga form, so that’s a novelty. An unexpectedly anime-looking approach to Mario, serving up shonen-style racing drama on the mean streets of Mario Kart DS. 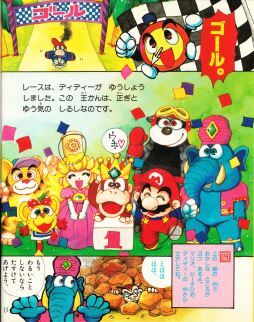 Characters tune their cars, rivalries and alliances form on the track, and half the racers are colluding to stop Mario from winning. Mario and Peach might not look much like themselves, but it’s nothing if not dynamic. A particularly light-hearted and silly series based on Super Princess Peach, who giddily glides her way through the game’s locales and challenges. The art’s a bit wobbly, but it’s charming enough. The author of Spider-Man J brings you slapstick-heavy adventures with Wario and the cast of Master of Disguise! A bit of episodic treasure-of-the-day nonsense with some terrific comic illustrations, and putting the spotlight on characters that were never acknowledged again. 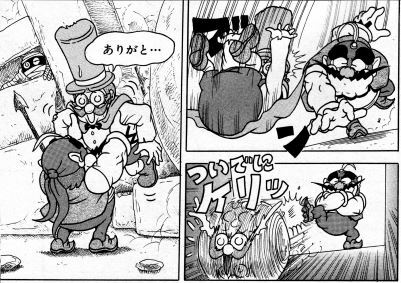 It reformatted in 2008 for Wario Land: The Shake Dimension with Wario schmoozing aboard the ship of a redesigned Captain Syrup. It maintains the same slapstick nonsense all the way through, though I confess the Master of Disguise stories have an even greater comic edge compared to the later stuff in my opinion; its human characters make funnier targets for physical comedy than the bumbling Bandinero. Not that I’d turn my nose up at any Wario content, mind. A two-page comic feature alongside an explanatory section of the magazine outlining features on Nintendo hardware, how they’re used and what you can use them for, such as the Mii Channel, the DSi camera and more. 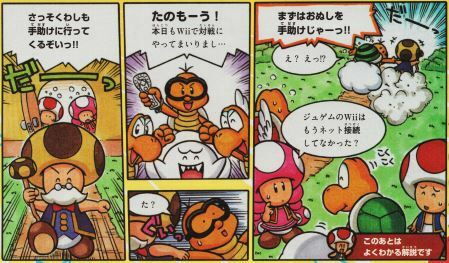 The comic pages feature allegedly-comical misinterpretations courtesy of Toadsworth and crew. As far as I can tell, although CoroCoro’s Super Mario-kun is still going strong, new series appear to have dried up in the 2010s. And this isn’t even getting into 4-koma anthologies, prose stories, comics that were only released as books or part of strategy guides…! I won’t lie that I’d love to see more of these scanned and archived in some way. 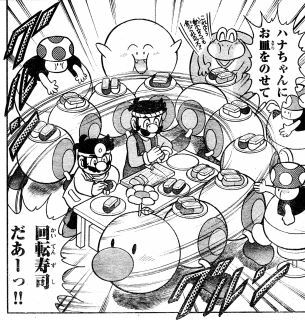 Although trivia blogs like Supper Mario Broth and Forest of Illusion have helped raise awareness for obscure Japanese media we’d otherwise be oblivious to, efforts to archive or translate them have been a bit scattershot, at least in regards to manga… and naturally, considering that’s a legal landmine (especially with Nintendo on the warpath over ROM sites lately). It’d be nice for folks to experience Super Mario-kun – one of them, any of them! – with more knowledge than just speculating off pictures or individual chapters. Hell, half the series here have never been reprinted in book form, and those that have often aren’t even comprehensively or are growing rarer and more expensive as the years go on! A good chunk of TV Magazine issues are available for cheap on Mandarake, it’s mighty temping to stockpile on it and start archiving Tobidase! Mario… but I think I’ve taken on enough foolhardy projects for one lifetime. If someone wanted to chip in on the costs, maybe…! Anyway, this was one way to fill a couple of evenings! I could go out more instead… or I could make a start on my list of top 5 most handsome Bowsers. Hmm! This was written by Ragey. Posted on Monday, October 1, 2018, at 3:54 pm. Filed under Uncategorized. Tagged comics, mario. Bookmark the permalink. Follow comments here with the RSS feed. Both comments and trackbacks are currently closed. ‹ 193rd DUNK: Infringement?! Slam Courtroom! !